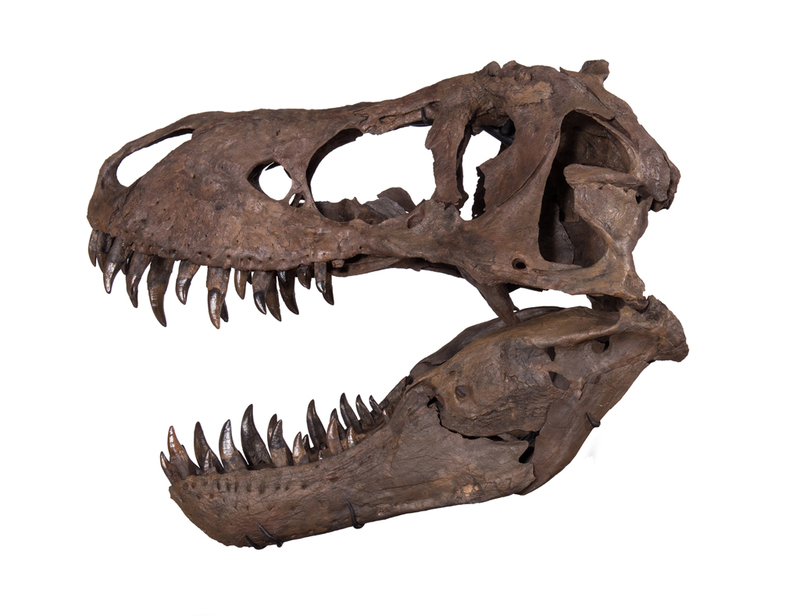 TE-076 is a high quality composite skull and neck mount of the iconic Tyrannosaurus rex. 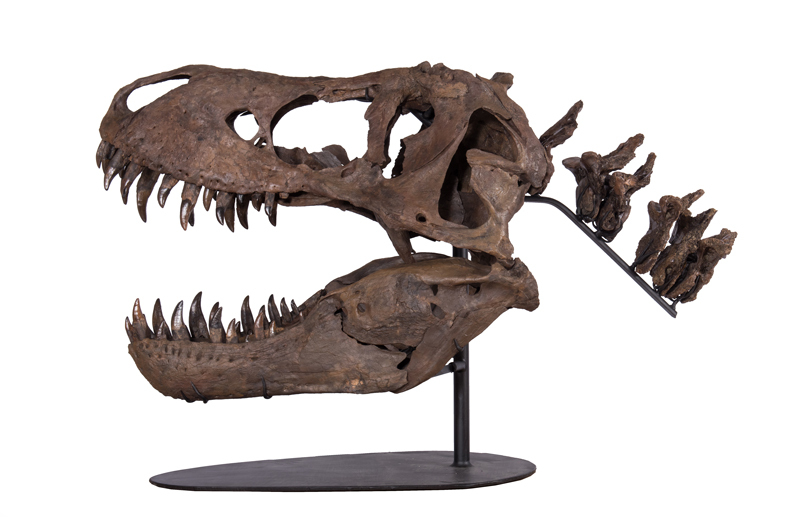 Collected in Summer 2013, this partial T. rex skull has been presented with replicated elements to create a unique and dramatic mount ready for exhibition. This exceptional specimen highlights the formidability and amazing size of this remarkable dinosaur by presenting a 360 degree, eye-level mount, which illustrates the frightening allure T. rex still possesses. 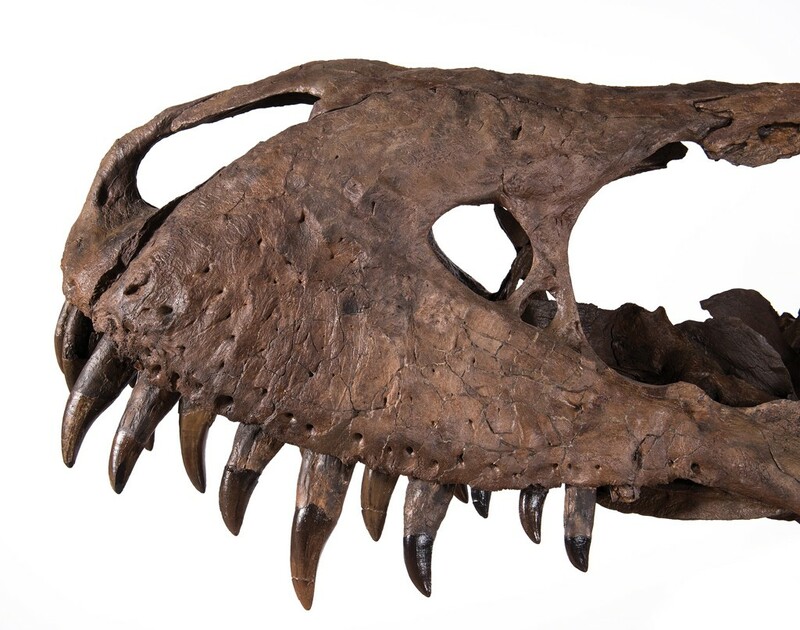 Front-and-center on the mount is the exceptionally preserved left maxilla, which beautifully shows the powerful jaw structure of this fearsome carnivore. Dull and broken teeth were repeatedly replaced with age and an example of this attribute is nicely preserved by two fractured teeth still rooted in the jaw and a replacement tooth, emerging from within its alveolus. Preserved and mounted with the partial skull are the rare cervical vertebra, which create the neck that would have connected this dentigerous weapon with the 36 ft, 7.5-ton predator behind it. Tyrannosaurus rex stands alone among terrestrial carnivores. 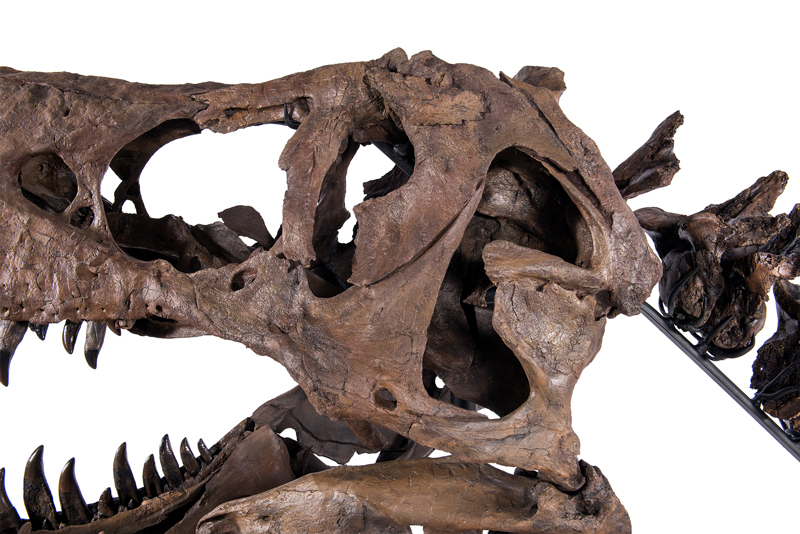 It remains the most recognizable of all the dinosaur species and its skull is a visual reminder of what life must have been like 65.5 million-years-ago. TE-076 is an extraordinary and distinctive mount, which attractively displays the characteristic features of this celebrated king of dinosaurs. TE-076 is composited around an equisite left maxilla recovered from a partial skeleton site south of Jordan, Montana. The geology of the site was largely a clay/mudstone matrix, which is generally indicative of a slow moving aqueous environment. The site did not contain additional skull material, so the fortunate find has been accented with additional skull material and replica bones to create this unique offering. Left dentary and right supradentary fragments are also represented in the specimen. The completed skull has been augmented by the inclusion of six fossil cervical vertebrae which were discovered in a single site north of Jordan, MT. The extremely rare cervical vertebrae, which are mounted on a removal armature, complete the display and help to amplify the overall impression made by the specimen. The material collected and composited to complete TE-076 dates to the Maastrichtian age of the Late Cretaceous epoch, roughly 72 – 65.5 million-years ago. Tyrannosaurus rex was among the last of the dinosaurs extant at the time of the extinction event which abruptly ended the Cretaceous. 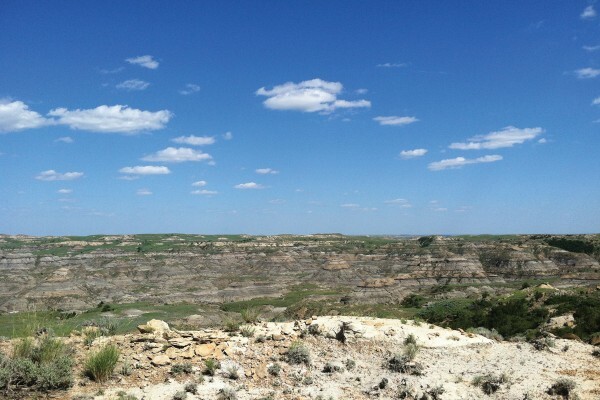 TE-076 contains Tyrannosaurus rex fossils recovered from two partial skeletal sites discovered on private ranches deep in the heart of the prolific Hell Creek Formation. 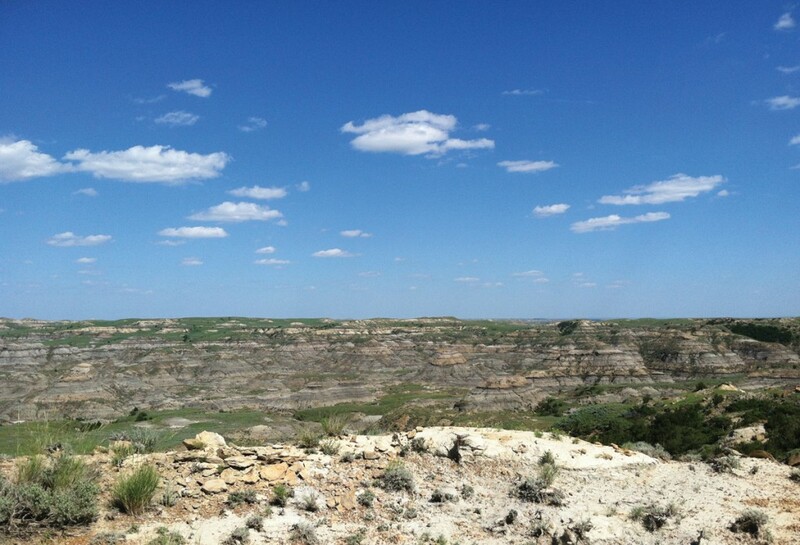 This locality has produced some of the most notable examples of Late Cretaceous fauna including T. rex and Triceratops sp. All fossils recovered have been fully prepared and stabilized for mounting. Fossil material is of a very good quality, exhibiting beautiful detail, solid outer surfaces, and a natural dark brown patina common in fossils recovered from iron rich geological formations such as the Hell Creek Formation.